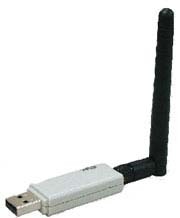 This WiFi USB 802.11n/b/g uniquely offers a detachable antenna to extend the range & configuration of your wireless network. With 802.11n technology, it offers data speeds up to 150 Mbps which is 3X faster than older 802.11g speeds, and ample enough badnwidth for home DSL / Cable Internet speeds. (** note: 802.11n is compatible with 802.11g networks). This wireless USB dongle is ideal for mobile computing or custom computer box solutions.